The most efficacious childhood obesity prevention interventions have involved caregivers directly or indirectly. Due to the high reliance on technology, research examining technological intervention approaches is warranted, particularly during the summer when parents may be more difficult to engage and the risk for excess weight gain among children is high. The feasibility and acceptability of a multi-component childhood obesity prevention intervention incorporating a caregiver component utilizing technology-based approaches—texting and social media—was explored. 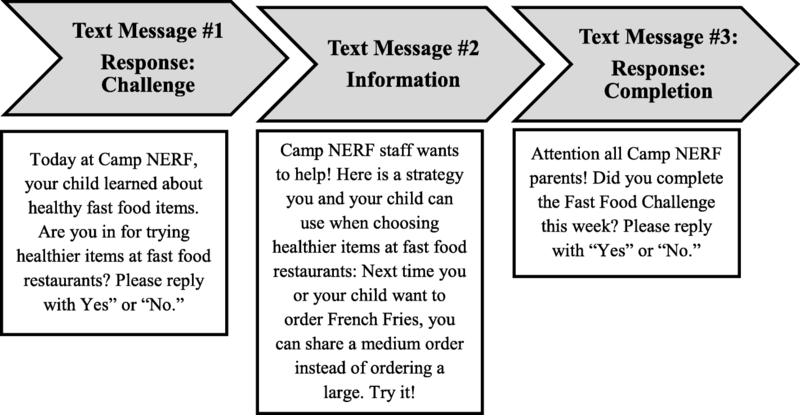 This was an internal pilot of the Camp Nutrition Education Recreation and Fitness (NERF) study, a group RCT for school-age children coupled to the USDA Summer Food Service Program. Feasibility and acceptability of the technology caregiver engagement component were assessed via process outcomes (participation rates) and in-depth interviews. Participants (n = 37) were 91.9% female, 91.8% Black, 58.7% low-income, and 75.0% overweight/obese. Participation rates in texting and social media were 62.2% and < 3%, respectively. Themes emerged from the in-depth interviews were texting provides connection; desire more involvement with program; fear social media privacy intrusion. Results will be used to inform changes to technology-based caregiver engagement strategies to be tested in future interventions. The persisting childhood obesity public health epidemic  demonstrates the need for expanded research focused on identification of effective obesity prevention strategies. Caregivers have a major influence on children’s health behaviors and weight status  through key personal affective factors (e.g., self-efficacy) and dietary and physical activity behaviors. Not surprising, the most efficacious childhood obesity prevention interventions have involved caregivers directly or indirectly [3, 4]. Past efforts utilizing traditional caregiver engagement approaches, such as in-person  and print media , have produced positive findings. However, due in part to the high reliance on technology (e.g., texting, social media), research examining these non-traditional technological approaches is warranted. Importantly, the potential for such technology approaches to serve as theoretically sound behavior change intervention strategies, either singularly or as part of a multi-component approach, for self-monitoring with immediate feedback, as well as an opportunity for support, behavioral nudging, and positive reinforcement , has rapidly emerged. Several literature reviews have been published highlighting the potential benefits of the use of such technologies in the specific area of childhood obesity prevention research [8–12]. However, the research is limited and none have explored the use of such caregiver targeted technologies as components of childhood obesity prevention intervention studies during the specific timeframe of summer when school is out of session and caregivers may be even more difficult to engage and child health is at a relative high risk compared to the academic months. The primary objective of this internal pilot study was to examine the feasibility and acceptability of technology-based caregiver engagement strategies (texting, social media) through assessment of process outcomes and feedback from caregiver participants. This was an internal pilot of the 2015 Camp Nutrition Education Recreation and Fitness (NERF) study, an 8-week pre-test, post-test group RCT to prevent unintended, unhealthy weight gain during the summer months in underserved school-aged children . Briefly, Camp NERF was a multi-component nutrition, physical activity, and mental health education intervention coupled to the US Department of Agriculture (USDA) Summer Food Service Program (SFSP), specifically open sites located at public elementary schools. Twelve eligible sites were identified and randomized (site level) to 1 of 3 programming groups: (1) Enhanced Care (nutrition, physical activity [PA], mental health, peer mentors, and caregiver engagement); (2) Standard Care (nutrition, PA); or (3) Active Control (non-nutrition, non-PA, non-mental health 4H [Head, Heart, Hands, and Health]). Caregivers enrolled in the Enhanced Care arm of the main RCT (n = 37) were invited to participate in the current pilot via the baseline caregiver assessment form which was administered as part of the main RCT . Technology-based approaches—texting and social media—for engaging caregivers were selected based on their appropriateness for the target population  and included a texting program that utilized a mass messaging platform (TextIt)  and social media. They were piloted during weeks 4, 5, and 6 of the 8-week intervention. Text message frequency, type, and content were chosen in reference to other similar research [16, 17] and with input from local stakeholders (i.e., leaders from local government offices and non-profit organizations) and key informants (i.e., site staff) doing active work in the area of summer nutrition. Caregivers were provided the option to receive three text messages per week over the course of the study. The texts were (1) response messages (two types—challenge or completion), probing participants to reply to the text; and (2) information messages, providing nutrition or physical activity information or strategies. The first weekly message was a challenge response message, which (1) introduced the weekly nutrition or PA topic presented to their child during programming and (2) encouraged completion of a specific family nutrition goal to be attained by the end of the week. The second weekly message was an information message, which consisted of either educational information related to the topic of the week or a strategy to assist the caregivers in reaching the weekly goal. The final weekly message was a completion response message, which inquired about completion or achievement of the goal-setting challenge proposed at the start of the week. Figure 1 provides a schematic of the response (challenge or completion) and information text messages for 1-week period. Table 1 provides an overview of all text messages sent during the 3-week pilot. Today at Camp NERF, your child learned about healthy fast food items. Are you in for trying healthier items at fast food restaurants? Please reply with “Yes” or “No”. Camp NERF staff wants to help! Here is a strategy you and your child can use when choosing healthier items at fast food restaurants: Next time you or your child want to order french fries, you guys can share a medium order instead of ordering a large. Try it! Attention all Camp NERF parents! Did you complete the Fast Food Challenge this week? Please reply with “Yes” or “No”. Happy Tuesday Camp NERF parents! Yesterday at camp, your child learned about “screen-time” and its consequences to our health. Screen-time is the total amount of time someone spends in front of any kind of screen, whether that be a TV, computer, cell-phone, or other handheld device. Doctors recommend that children should have no more than 2 hours of screen-time each day. This week, we challenge you to limit your child to 2 hours or less of screen-time. Are you in? Please reply with “Yes” or “No”. Camp NERF parents, did you know that too much screen-time is also related to overweight and obesity? Here is a reason why: spending too much time sitting in front of a TV or computer screen means that we are not spending enough time being physically active, preventing our body from burning enough calories to balance the calories we eat. I hope this will encourage you to help limit your child’s screen-time this week! Do not forget to add us on Facebook: just type Camp NERF in the search bar and click “join group”! Good evening Camp NERF parents! Did you complete the Screen-Time challenge this week? Please reply with “Yes” or “No”. Week 6 of Camp NERF has begun and it’s all about BREAKFAST – the importance of eating breakfast every day, and the healthy food options for a perfect kick-start to our day! So far, we have learned to watch out for cereals with extra sugar and to add fresh or frozen fruits to whole-grain cereals to give our bodies a boost of energy. This week, we challenge you to simply add some fruit to you and your child’s breakfast! Whether you give them a fresh banana, cut up strawberries to add to their cereal or oatmeal, or make a breakfast smoothie with 100% fruit juice, we encourage you to BOOST their BREAKFAST! Are you in? Please reply with “Yes” or “No”. Happy Friday Camp NERF parents! Along with learning about breakfast this week, we also learned about calcium-rich foods that are good for building STRONG bones. Did you know that many calcium-rich foods are also perfect breakfast options? - like low-fat plain milk, low-fat yogurt, and low-fat cheese! However, we can also get calcium by eating other foods, such as spinach, almonds, eggs, oatmeal, broccoli, and sunflower seeds to name a few. Whether you get your calcium from dairy or from the other items I have listed, it is still important to get calcium every day for best bone and teeth health. Good luck with this week’s challenge! Good evening Camp NERF parents! Just checking in to see how this week’s BOOST your BREAKFAST Challenge went! Did you complete the challenge? Please reply with “Yes” or “No”. Facebook and Instagram were selected as the social media platforms based on the Pew Research Foundation data which indicate that these are the most utilized outlets among low- to moderately low-income US adults [16, 18]. The nutrition topic for the week was presented on each platform and explored in greater depth by providing links to simple food recipes, news items, and recent educational articles related to the weekly topic. In addition, images or videos were added for caregivers to view and interact with counselors and other caregivers. Tables 2 and 3 provide matrices of the Facebook and Instagram posts during the 3-week pilot. “Camp NERF - Nutrition, Education, Fitness, and Recreation - is a fun program for children grades K-5 to attend during the summer months to learn the basics of nutrition and mental health education, as well as to remain physically active while school is out! This page is for you, as parents and caregivers, to see what kinds of lessons and activities your child is participating in throughout the summer. We hope this page will encourage you to interact with your child to facilitate their learning and make this summer FUN! Image of children learning how much sugar is in cereal. The grades K-2 group at [School Name] learning how much sugar is in ONE SERVING of sugary cereals, like Cocoa Puffs, Cinnamon Toast Crunch, or Frosted Flakes! The target population was underserved minority children entering kindergarten through fifth grade and their adult caregiver from underserved neighborhoods in Columbus, Ohio . Data regarding participation in the text messaging and social media platforms were retrieved from respective platform websites. Participation rates were defined as enrolling in the texting program and engaging in social media at least one time. All caregivers at the Enhanced Care sites who agreed to participate in the pilot were invited to complete in-depth interviews at post-intervention to elicit feedback on the technology engagement strategies. Interviewers were audio-recorded, transcribed verbatim, and checked for accuracy. Caregivers completed a demographics questionnaire and provided self-reported height and weight to the nearest inch and pound. BMI was calculated in kilogram per meter . For race/ethnicity, participants were classified as either Black or non-Black. Participants were classified as Black if they reported being African or African American or both African and African American and another race/ethnicity. All others were classified as non-Black. For household income, a binomial variable (low-income = 0; non-low-income = 1) was created. Annual household income data were collected categorically: (a) < $10,000; (b) $10,001–20,000; (c) $20,001–30,000; (d) $30,001–40,000; (e) $40,001–50,000; (f) $50,001–60,000; (g) $60,001–80,000; and (h) > $80,000. Based on responses to the categorical annual household income question, participants were assigned an income level based on the mid-point between the income ranges. This annual household income level was compared to the national poverty guidelines , and based on the number of individuals living in the household, participants were classified as low income or non-low income. Exploratory data analyses were conducted to determine if there were any demographic differences among caregivers who engaged in the internal pilot study versus those who did not. Participation in the social media platforms was virtually non-existent, so only texting was explored. A texting engagement variable was created, and participants were assigned a value of 0 (no), 1 (low), or 2 (high). A value of 0 indicated that caregivers did not participate in text messaging; meaning, they opted out of text messaging at baseline. A value of 1 indicated that caregivers received all of the text messages but did not interact or respond to any of the response-type (challenge or completion) text messages. A value of 2 indicated that caregivers received all of the text messages and interacted or responded to at least 1 of the response-type text messages. ANOVA and chi-square tests were conducted to determine if there were any demographic differences among no-, low-, and high-texting users. For the in-depth interviews, data analysis was guided by Grounded Theory and Interpretive Phenomonology [20, 21]. Line-by-line open coding was conducted by researchers to determine emerging themes and constant comparative analysis was employed to develop a codebook to derive focused codes from all interviews [20, 21]. The study was approved by The Ohio State University Social and Behavioral Institutional Review Board (2014B0197). Thirty-seven caregivers enrolled in the Enhanced Care arm of the main study. Descriptive summaries of participant baseline measures are presented in Table 4. Participation rates in the internal pilot study were texting—62.2% (n = 23); and social media—Facebook, 2.7% (n = 1) and Instagram, 0.0% (n = 0). Texting participation was further explored. One individual dropped out of the texting program after week 1. Participant characteristics did not vary by level of texting engagement (Table 4). The mean number of response texts (challenge and completion combined) received per week was 8 out of 46 sent to the 24 participants (17.4% response rate), with a higher mean challenge text response (n = 5 out of 23 or 21.7%) compared to the mean completion text response (n = 3 out of 23 or 13.0%). 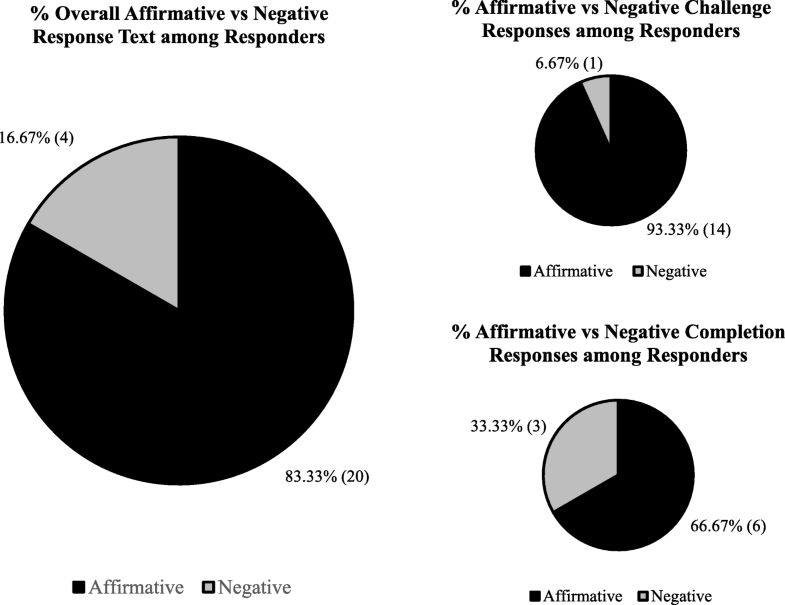 Of the 138 response texts sent over the course of the 3-week pilot test, the total affirmative (“yes”) responses to accept or complete the challenge was n = 20 out of 24 received (83.3%) and higher for the challenge texts (n = 14 out of 15 or 93.3%) compared to the completion texts (n = 6 out of 9 or 66.7%) (Fig. 2). Three main themes emerged through the in-depth interview data analysis. Caregiver feedback (n = 3) revealed a perceived connection to camp programing through text messaging, a desire for increased caregiver interaction with daily camp activities, and a perceived potential intrusion of privacy via social media use. Participants conveyed that texting provided them with insight and connection to the camp activities and lessons. Caregivers were able to reinforce camp lessons through healthy behavior modifications at home prompted by the weekly challenge and informational messages. Participants were also able to engage other family members not enrolled in the camp and encourage them to participate in the positive behavior changes. Participants expressed that the text messages provided caregivers with an undemanding, virtual connection to the camp activities. Receiving and replying to text messages was less involved than requiring caregivers to physically come to the camp setting. Additionally, the text messaging platform allowed participants to respond on their own time as their schedule permitted without demanding an immediate response like a phone call requires. Participants were asked to provide details regarding what they enjoyed about the text messaging platform. All participants specifically referenced the weekly challenge messages prompting caregivers to implement a healthy suggestion as a positive component of the intervention. The challenge messages motivated and encouraged participants to try and apply new habits and activities in their home environment. All participants agreed that three text message matrices per week were an acceptable and sufficient amount of weekly contacts. The spacing between messages provided adequate time to consciously think about and implement healthy suggestions without burdening participants with overly frequent contacts. A few participants commented on the simplistic and unintrusive nature of the text messaging intervention. One participant noted that the messages provided quick and easy access to healthy habit suggestions without delivering an overwhelming amount of content. Participants also proposed that text messages were less invasive than other forms of contact such as weekly phone calls or daily emails from camp personnel. Participants were asked to reveal what they disliked about the text messaging intervention and provide suggestions for improvement. Multiple participants expressed a dislike of not being prompted to respond to all three weekly message matrices. Participants recommended utilizing a more interactive messaging platform with more opportunities to reply and participate in challenges. In addition to text messaging, participants also approved of a social media presence. Multiple participants perceived the Camp NERF social media platforms as informative means of learning what the children are doing during the day at camp. A participant expressed a desire for copies of camp itineraries, including breakfast and lunch menus. Increased caregiver knowledge regarding the daily camp menus may offer ideas for healthy family meals at home and reinforce lessons taught at camp. Another participant suggested offering more activities to involve caregivers and other family members not enrolled in the camp. Family participation may improve self-efficacy and social support for making healthy decisions outside of the camp setting. While caregivers supported using social media for viewing information about camp lessons and activities, participants expressed concern about a potential invasion of privacy. Caregivers may fear judgment about their child-rearing style based on their personal social media account posts, or they may feel unsafe sharing information about their family with other participants and camp personnel. Another participant noted that their personal social media account does not use their actual name. Participants using pseudonym accounts may be difficult to reach and invite to join camp social media websites. Additionally, camp personnel may not approve of pseudonym accounts accessing the camp websites in order to protect the confidentiality of camp participants. The main objective of the current study was to assess the feasibility and acceptability of the technology caregiver engagement strategies through assessment of key process outcomes (rates of participation) and by eliciting feedback from intervention caregiver participants via in-depth interviews. This was an internal pilot study that occurred as part of a larger RCT (Camp NERF 2015), in which child weight status (i.e., BMI z-score) was the primary outcome of interest . Due to the multi-level nature of Camp NERF intervention, the objectives of main RCT extended beyond the child to include assessment of caregivers (i.e., self-efficacy, physical activity, and BMI), though are not presented here given the nature of the publication (i.e., pilot and feasibility studies) . Results demonstrated mixed findings in that participation in the social media component was low (< 3% participation rate, low feasibility; comparatively low to similar research ) compared to the texting program component (62% participation rate, high feasibility; comparatively high compared to similar work ). The relative low participation rates for Facebook and Instagram could be due to the issue of participants not having accounts with the two platforms; however, it is not possible to confirm this with the data collected. It may also be attributed to differences in recruitment efforts and inherent differences between the technologies (social media, texting). For the texting program, participants who indicated during the baseline form that they wanted to participate were automatically enrolled in the program through the TextIt  platform. For the Facebook and Instagram programs, participants were invited to the Camp NERF pages through the social media platforms, but would have to log-on, accept the invitations, and actively engage. Data from the in-depth interviews revealed that there was difficulty in locating and inviting caregivers to participate in the Camp NERF pages due to participants using pseudonym accounts. To uphold participant confidentially, future program social media pages may not allow participants with pseudonym accounts to become members of the page thus limiting caregiver engagement. Additionally, themes derived from the in-depth interviews indicated a privacy concern among caregivers. Caregivers were apprehensive about the visibility of their social media profile information and personal posts. This concern may be explained by caregivers feeling unsafe sharing information about their families and children with other members of the camp page that they may not know or trust. Additionally, caregivers may fear judgment and evaluation of their lifestyle or child-rearing methods from other caregivers or camp personnel. Both a fear of sharing personal information and receiving judgment from others may have contributed to the lack of participation in Enhanced Care social media platforms. These results point to the critical need for caregiver engagement technology components in future iterations of Camp NERF and other similar childhood obesity prevention interventions that include feedback from the target-audience (e.g., identification of strategies to overcome the fear of privacy breaches on social media to improve caregiver engagement) for optimal intervention tailoring and effectiveness. Adapting “lessons learned” from other similar research will also be important (e.g., making the social media website private, including a video-based curriculum) . Due to the higher participation in the texting program component, a higher volume of process data was collected relative to the social media component. Analysis of texting program process data revealed that those who responded to a text, were more likely to respond to the “Accept the challenge” vs “Complete the challenge” text, and more likely to provide a “Yes” vs “No” response to the “Accept the challenge” vs “Complete the challenge” text. Results may imply that caregivers are more willing to accept health challenges, and less willing to complete such health-oriented challenges . Future research should focus on ways to increase completion of health challenges among caregivers, such as utilization of a mobile app in addition to texting . Also, analyses revealed that those who responded to a text of either type text (“Accept the challenge” vs “Complete the challenge”) were more likely to give a “Yes” vs “No”, which may imply that people desire to be engaged with the intervention activities, which corroborates with the data generated from the in-depth interviews that participants enjoyed the texting piece of the intervention because it made them feel connected to the program. On the other, these data could indicate a potential social desirability bias . Future research should continue to include qualitative assessments (i.e., in-depth interviews) to better understand the underlying reason(s) the increased probability of providing an affirmative text response. Strengths of the current study include the mixed-methods approach to data collection, which provided the ability to probe deeper into the trends observed in the (quantitative) data. In addition, the collection of process outcomes data for the technology components allowed the opportunity to determine responsiveness to the techniques. The primary study limitation relates to the timing of the pilot. Relative to the main 8-week RCT, it was conducted during weeks 4 to 6. Ideally, this pilot work have occurred prior to the main RCT, however, this was not possible given the time constraints relating to funding. In addition, there were challenges in recruiting caregivers, a common issue at USDA SFSP open sites where caregivers are not required to accompany their children to the program. Regardless, this work is critical for informing changes to technology-based caregiver engagement strategies to be tested in future interventions. Another limitation is the low response rate for the in-depth interviews. It will be imperative for future efforts to increase the number of participants interviewed to confirm that the themes identified here are in fact true. Results from this study may be utilized to improve caregiver engagement strategies in the delivery of future iterations of Camp NERF and other similar health behavior interventions for underserved school-age children during the summer months, including development of tailored strategies to increase participation in the social media component (e.g., addressing issue of privacy concerns, match the ease with which participants are enrolled in social media to texting) and increase the number of caregivers who complete health challenges (e.g., addition of mobile app technology). We thank our participants and our community collaborations, Children’s Hunger Alliance and Columbus Recreation and Parks Department. The study was funded by the Aetna Foundation. The datasets used during the current study are available from the corresponding authors on reasonable request. CG led the conceptual development of the study with input from LCH, MF, BM, JDG, IE, CH, and JAK. LCH led intervention preparations and data collection with assistance from AW and AS. LCH led the data analysis with assistance from AW and AS. LCH and CG took primary responsibility for writing the manuscript. All authors contributed to editing the manuscript and read and approved the final paper. This study was approved by The Ohio State University Behavioral and Social Sciences Institutional Review Board. Caregiver consent was received from participants prior to enrollment. Pew Research Center. Social Media Fact Sheet. http://www.pewinternet.org/fact-sheet/social-media/. Department of Health and Human Services. 2015 U.S. Federal Poverty Guidelines used to Determine Financial Eligibility for Certain Federal Programs. https://aspe.hhs.gov/poverty-guidelines.